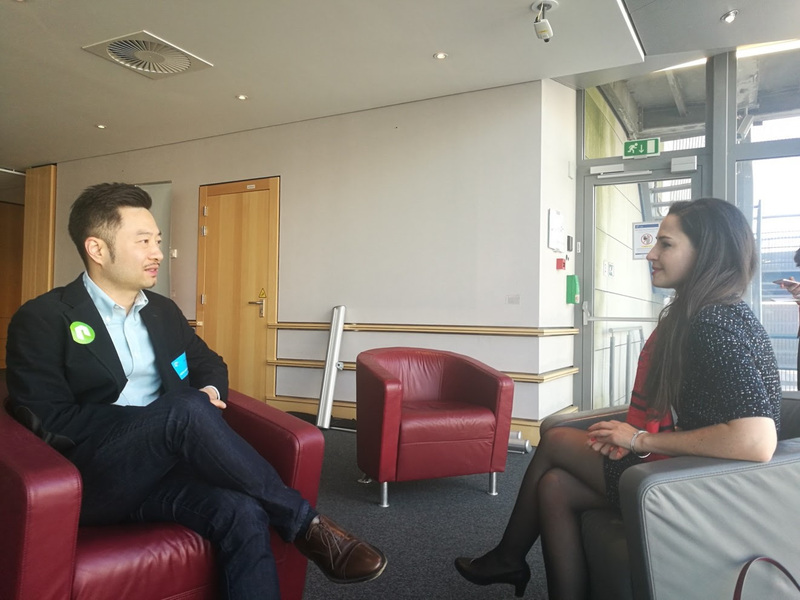 As many believe blockchain would bring next breakthrough to business as the internet did, Da Hongfei, founder of NEO, one of the world’s biggest cryptocurrencies in terms of market capitalisation, foresaw real adoption of this technology in about 3 years, he told Claudia Vernotti, Director of ChinaEU, in Brussels during a recent exclusive interview. “It is still quite early for massive adoption. I expect to see real adoption of blockchain technology in about three years’ time,” Da told ChinaEU in the sidelines of the Smart Economy Expo, which took place in the European Parliament on May 2 and 3. Da’s NEO, generally known as the “Ethereum of China”, was founded in 2014 and quickly climbed into top ten ranking by market capitalization. Defined as an open network for the smart economy, NEO is viewed by investors as the first Chinese cryptocurrency to hit the mainstream. Da and his team visited several European capitals and reached out to academics, lawmakers and local communities. He told ChinaEU that Europe has a quite strong culture with open source which is good for public blockchain projects to work with local communities. Against the backdrop of tightened measures from few countries’ governments on cryptocurrencies, Da held the view that strict rules would not hinder the development of blockchain technology. “So far, the regulation is good to prevent speculation,” he said, adding that a certain level of regulation is not an obstacle to the development of the core technology behind blockchain. NEO founder also shared stories on how he started in the blockchain world, on NEO’s mission and its characteristics, on the lessons he learned from the Europe trip and on his views on regulations. The following is a Q&A record of our exclusive interview with Da. ChinaEU: How did you get engaged in the blockchain sector? DA: I got involved quite early in 2011. Back at the time, everybody soon jumped into this industry because of bitcoin. I came across bitcoin in 2011. Right before that time, I was having phone calls every week with one of my classmates and colleagues. But at that time, I was running an education consulting business and he worked in Tokyo for a financial institution. We discussed a lot about the differences between the Chinese economy and Japanese economy, culture and monetary theory during that time. Then I came across bitcoin and we just fell in love with the cryptocurrency. We spent a lot time researching and discussing on it and that is how I got involved in this industry. CHINAEU: How does NEO differentiate from other blockchain projects? Da: NEO is not really a cryptocurrency. Holding NEO means you are holding a stake of the network, you can govern the network with NEO by voting. It’s very different from other cryptos like bitcoin. NEO is meant to link the physical world, the real economy, with the blockchain world. So, it’s designed to serve the real economy. CHINAEU: The original name of NEO was “Antshares”. Why this name? Any reference to Alibaba’s Ant Financial? DA: That name referred to shared access. “Share” can be a piece of something and also can be a verb. Ants share their economy, they are very small but together form an economy, they can do bigger things because they share resources. At the time of the creation of AntShares in 2014, Ant financial did not even exist. Basically, they use a similar name; in English it is the same, but in Chinese it is a little bit different. We called ourselves “xiaoyi” or “small ants”. Ant Financial instead goes with the name of “mayi” or “ant”. To avoid confusion between the two, in 2017 we made a major rebranding into NEO, with the mission to create the smart economy of the future, through the combination of digital assets, a secure digital identity and smart contracts. CHINAEU: NEO positions itself as regulatory friendly. What does this mean? NEO: The very structure of NEO makes it regulatory compliant. This is because, differently from other platforms like say Ethereum, every entity operating on the NEO platform is expected to have a unique verifiable digital identity, in a way that regulators can possibly identify the person who executed the transaction, if problems arise. This inherent compliance-ready technology makes the system especially respectful to regulations like data protection and anti-money laundry. CHINAEU: China made the headline as a “non-crypto friendly place” due to recent bans on ICOs and crypto exchanges. Do you believe those regulations were too harsh for the crypto space? DA: The crackdown has been good to prevent speculation and hinder fraudulent activity in the market caused by the ICO model. Many projects have been using blockchain simply because of the opportunity to raise new funds through the ICO model, not because of a real need to use the technology of blockchain. Those people that are developing the technology are still here, they’re not giving up, they’re still doing a lot. Blockchain is an open soft source technology. If there is progress in other projects, people can learn from it by looking into the open source. Even if we have very strict regulations on ICOs, I don’t see it as an obstacle for the development of blockchain technology. CHINAEU: Do you expect Europe to develop similar regulation in the near future? DA: I don’t see particular regulations on cryptocurrencies or blockchain technologies coming soon in the region. Europe is quite liberal in this field. In the US, SEC is going after a lot of ICO projects very practically, but we haven’t seen that in Europe yet and I believe the risk for new regulations here is not very high. CHINAEU: What did you learn from your Europe tour? DA: In Amsterdam, we saw quite a strong developer community. And in Zurich, we visited the University of Zurich, there were students and professors attending our meeting. It was pretty good. In Brussels, we are talking to both the developer community and the European parliament. It is very interesting as this is one of the few times we talk to politicians, we did it in Korea one month ago. Our impression is that people in Europe do like new technologies, they want to get involved. There is a quite strong culture of open source, which is good for public blockchain projects to work with local communities. CHINAEU: In five years‘ time, how do you see the development of NEO in Europe? What’s your goal? DA: Five years is a long long time for this industry. I hope in five years we will see real applications in blockchain. Today we are still doing the structures. It is still quite early for massive adoption. I expect to see real adoption of blockchain technology in about three years’ time.